Shortly before Caemon was diagnosed with leukemia, I was reading the book The Immortal Life of Henrietta Lacks, the true story of a young African-American woman who had died of a very aggressive form of cancer. Lacks’ cells were taken without her family’s permission, and they were grown and regrown for decades, sold to labs all over the country and became integral in making countless medical breakthroughs. Hers is a fascinating and tragic story, something with which I could only identify on an academic level as I read it. The night we learned that Caemon had leukemia, we were asked to sign the first set of what felt like hundreds of sets of papers entering Caemon into this study or that, allowing permission for his blood and cells to be studied by countless researchers, and I found myself commenting that night, even through my shivering and shock, that we’ve come a long way since Henrietta Lacks. The doctor who was with us smiled sadly and agreed, and Jodi and I expressed our appreciation that something good might be able to come out of Caemon’s diagnosis. We wanted to help, and if they were taking his blood anyway, we may as well allow for them to use it to learn. I don’t think I imagined in that moment, even as I alluded to Lacks’ own life and enduring cells that my son might gain his own immortality through the many blood samples that would be taken through the course of his treatment, but sure enough, he has, at least to some degree. Caemon had copious vials of blood drawn during his five and a half months of treatment, and while most of those went to the lab to test for blood counts, viruses, chemo levels and more, some of them went to his oncologist’s laboratory to aid in her team’s research on JMML. On a fairly regular basis, a doctor from her lab, Dr. Stieglitz, would come to speak with us about Caemon’s status and would share information they had learned about his disease through their work. There was a certain reassurance in talking with him. He adored Caemon, and Caemon adored him right back, and by talking about the basic science of Cameon’s disease and the changes it went through, we could begin to understand the mystery that JMML was–and is. We could already see that this doctor, who saw Caemon not just as a research subject but as an amazing little boy, an inspiration even, was going to help fulfill that wish that some good come from Caemon’s disease. It wasn’t until Caemon died, and we were learning the results of his autopsy that we visited Dr. Loh’s lab where our son’s cells now lived. It was a challenging day, but already, her team was learning from how Caemon’s disease had progressed in his body, and I knew they would continue to learn about him. Dr. Stieglitz shared that he often worked with Caemon’s cells in the lab, that he always thought of him, pictured him, used his life as inspiration to keep searching. To hear this on such a difficult day felt so promising. This past summer, over a year after that visit to the Loh Laboratory, we had contact with Doctors Loh and Stieglitz, who both shared with us that they were actively using Caemon’s cells in some fairly groundbreaking research, research that might allow them to understand why some kids with JMML do so poorly, why they relapse, why their disease progresses so quickly. They were learning from our son, who had proven to be an outlier with this disease in so many horrible ways, about how they might help other kids with the same mutations survive the disease. And to continue that research, they told us, because they didn’t have a limitless supply of Caemon’s samples, some of these blood samples, the last living parts of him, were being sent to a lab back east to be reproduced. Our son is, indeed, in some very real ways, living on. When we think about Caemon’s legacy, we often focus on what we do to raise money or to share his passions with other children, and these are no small matters. Every aspect of Caemon’s legacy work is sacred to us, but the signing of those papers during his treatment, the sharing of his cells may be the most life-changing thing we ever do. Our son’s own blood may save countless other parents from the agony of shattered hearts; they may indeed help other children grow up. Caemon’s legacy takes so many forms–of love, of wisdom, of living in the moment, of embracing one’s fears–but those cells of my precious boy are a legacy of life. This entry was posted in Uncategorized and tagged bereaved parents, Caemon, Caemon's Legacy, childhood cancer, childhood leukemia, JMML, pediatric cancer research on February 24, 2015 by T.
Do you get tired of being asked for financial donations to organizations such as the American Cancer Society, Leukemia Lymphoma Society, or St. Baldrick’s? Do you wonder whether the funds raised for cancer research ever reach the intended destination? Does it feel like your money just gets thrown into the giant maw of corporate fundraising? Well, we wondered these things too, and we were cautious about getting involved in large organization fundraising for these reasons. We wanted to make sure that any money raised in Caemon’s honor would go to the right parties, and for us, that meant funding JMML research. There was a lot to learn about each of these organizations and we needed to ensure that they were a good fit for us and our legacy work. 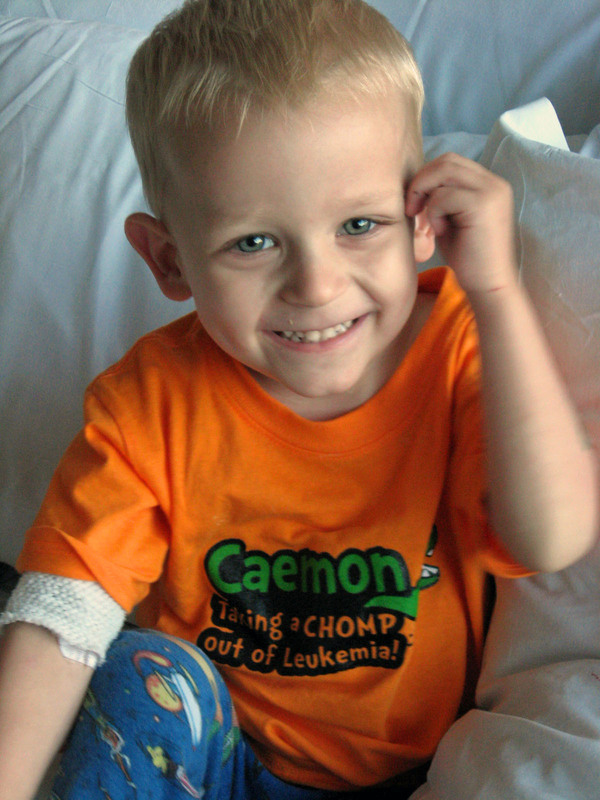 The same year Caemon died, we formed an LLS Light the Night team which raised $10,000 for blood cancer research. We had one of the largest teams at the walk, all of us decked out in our Team Caemon shirts showing off our Crocodile Pride, and carrying gold lanterns in Caemon’s memory. We were honored with the “Most Inspirational Team” award at the end of the fundraising season, a poignant and bittersweet moment for us personally as well as for the North Bay LLS crew who had grown attached to us and to our son. We continue to fundraise and walk with LLS because they are a tremendous organization that supported us when we were in the hospital and after Caemon’s death, but more importantly, we walk and fundraise with them because they are directly funding JMML research at UCSF. Caemon’s oncologist, Dr. Mignon Loh, is one of the world’s leading experts on JMML, and she oversees a lab full of brilliant people actively working to unlock the secrets of this type of leukemia. They are able to do their work because of an LLS grant. Caemon’s Uncle Seth spearheaded two St. Baldrick’s head-shaving events with his fire department, one of which I (Jodi) attended as a shavee. Because of these fundraising efforts, Caemon is now an honored kid for St. Baldrick’s, and as such, serves as inspiration for other fundraising events. We were honored to send Croc tattoos and photos of Caemon to a bay area roller derby team who hosted a shaving event. A research fellow at UCSF, Elliot Stieglitz is the recipient of a St. Baldrick’s grant, and he has been studying Caemon’s cells since his diagnosis. Dr. Stieglitz’s work will be explained in a later post, but we firmly believe the work being done will lead to a better survival rate for JMML patients. We are extremely proud of him, and we will continue to partner with St. Baldrick’s and support his research. 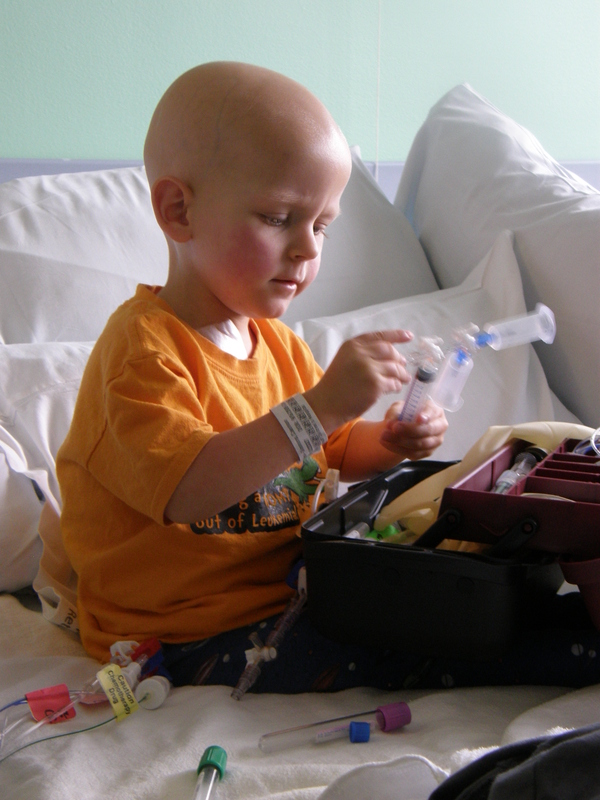 Curing childhood cancer is not out of our reach. At one time, a diagnosis of Acute Lymphoblastic Leukemia (ALL), the most common type of childhood leukemia, was a death sentence, but today, because of research, children with ALL have a 90% chance of survival. Sometimes it is hard to see any tangible evidence resulting from all of this fundraising, but when I think about childhood cancer survivors, like Bat Kid, I am encouraged. There should be a lot more like him, leaving leukemia in the rear view mirror and getting on with the business of growing up. The stakes don’t get higher than that, and we are determined to see that happen. This entry was posted in Uncategorized and tagged bereaved parents, Caemon, Caemon's Legacy, childhood cancer, childhood leukemia, grief, JMML, Leukemia and Lymphoma Society, St. Baldrick's on February 19, 2015 by T.
A year ago today, we woke up in our home as a family one last time. We got into the car together one last time, and we drove to UCSF with Caemon one last time. He was being admitted to the Bone Marrow Transplant Service and would begin his chemo conditioning regimen at 9pm. Before that, he had hours of tests and a fairly miserable scrub-down with a soap containing chlorhexidine, meant to remove as many bugs and outside germs as possible from his skin. His room from then on would be a clean room, one for which we would have to scrub in any time we left the hospital and returned. Caemon was so cooperative that day with so many things. He brought his medical supply tacklebox, having left his medical supplies at home (even these had to be fresh). He had a chest x-ray and sat so very still, and while that dreadful bath had him protesting wildly, he happily changed into comfy clothes and took a nap with Jodi on the bed while I decorated his new room with trees. But I can tell you that in my mind that morning, I wasn’t driving him to UCSF. When I woke up early, and he was still sleeping, I imagined staying home with him forever. I dreaded what was next, knowing the transplant itself could kill him. Every cell in my body wanted to hold tight to my little family snuggled up in our big bed and just never go. I wanted to see his hair grow back, watch him turn the lights on and off on our Christmas tree, dance with him free of tubes and hospital beds and worries about platelets. We had spent the last three days baking his favorite pumpkin muffins, going out at night to see Christmas lights on houses (in fact, one we visited all three nights we were home), lighting fires in our little pellet stove, and simply being a family with our own agenda, our own rules, our own space. If Caemon wanted to eat nothing but tuna sandwiches for an entire day, that was what he had. If we wanted to stay in our pajamas all day long, we did. We made messes, cleaned them up, hugged and danced and snuggled and played and read. It was bliss, and none of us wanted to leave it. In those moments, with our son the closest to leukemia-free he had been in who knows how long, it almost seemed possible to just forget about the hospital and just take our lives back. But it wouldn’t be possible without a transplant. We all knew that. We all knew the leukemia would return with a vengeance in no time if we didn’t go through with it, but the instinct to go anywhere but that hospital was strong in me that day, and I fought it over and over again as we packaged all of Caemon’s clothes in giant ziplock bags, placed his toys in sealed plastic tubs, packed up our own suitcases full of hospital mom clothes, and drove to San Francisco. That night, after the tests and the bath and after “Sad-Sad Boingy Tube” got hooked back up to the IV pole, and after Caemon and Mama had a nap, and I decorated the room with trees and lights and as much magic as I could muster, we sat together in his room, and we gave Caemon what he affectionately called his special BMT present: a little Christmas carousel that lit up and played music, something he had admired countless times the year before both in a store and in a book we had. Caemon loved carousels, so to have one of his one was pretty fabulous. He snuggled up by himself in his bed, turned it on, and lost himself in it. For nearly an hour, my son gazed at the lights and mirrors, listened to the music, and watched the little animals spin around and around. When the little bears riding one of the horses would come around, he would kiss his fingers and gently touch them. He did this over and over, speaking softly to the bears. He was a little boy, mesmerized by a holiday toy, and I found myself transfixed by the beauty of the moment, yet saddened too, for beyond the innocent smile and wonder, there was something else in my son’s eyes–a sort of resolve that came with being back in the hospital, hooked back up to tubes, submitting to treatments. To see a sort of knowing wash over him, to see him visibly coming to terms with leaving home and living in the hospital again broke my heart. Thinking back to all of that now is so hard because I know what he was about to endure, and I wonder if he was anxious about it. I wonder if he had any idea what was to come. I don’t know. I know that it was scary for all of us and that we maintained more hope than I ever imagined could be mustered, that we did everything we possibly could to save our son. A year ago today began the greatest fight of our lives, and while I know I wouldn’t have changed anything, I still sometimes wish we could have just stayed home, lit a fire, and snuggled up on the sofa with a big stack of books and our beautiful, beautiful boy. This entry was posted in BMT, grief and tagged Bone Marrow Transplant, Caemon, grief, JMML on December 10, 2013 by T.
In the days and weeks following Caemon’s death, I found myself wanting to pick up heavy, bulky things. I needed to feel the resistance of weight in my arms. For three and a half years, I had been building my strength as my son grew from his sturdy nine pound eleven ounce birth weight to the thirty or so pounds he was in his final year of life. As a mom of a young child, I became accustomed to having this boy in my physical presence at nearly all times, his weight in my arms. 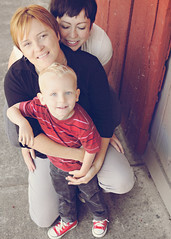 Jodi and I were fond of being close to our son, and he felt most at ease in our arms, so we kept him close throughout his early years knowing that soon he would be taking steps away from us as he went to school and began gaining more and more autonomy. For those first few years, though, that physical proximity of Caemon to me or Caemon to Jodi was a fact of life that we cherished. In the hospital, we also stayed close. From his first night there, we would lie in his bed offering comfort and familiarity in a place where everything seemed scary and foreign. I think we took comfort there too, for lying in his bed meant being the one thing that meant the most: being Caemon’s parents. When we found out Caemon relapsed, and everyone around us was telling us that the end of his life was near, we got the big bariatric bed so that we could all lie in it together, so that we could stay as physically close to Caemon as possible. He insisted at that point, even as miserable as he felt most of the time, that someone be in his bed at all times. Usually this meant me or Jodi, but sometimes it meant he would ask a nurse to lie down with him (for one favorite nurse visiting on her day off, he actually kicked me out of the bed so that she could lie next to him). He wanted the closeness with everyone, and we all obliged because if we could offer this beautiful boy of ours some comfort we would do anything we could. In those final days, we couldn’t hold him, for he was in too much pain, but we kept him so very, very close. In those first few weeks and months after Caemon died, I physically felt like I was missing something. I was missing a good thirty pounds that I needed to heft. I was missing the closeness a little boy shares with his mommy too: skinny arms draped around my neck, a sleepy head resting on my shoulder, soft little hands playing with own hands or moles or—one of Caemon’s favorites—my collarbones. In those early months, I could close my eyes and instantly feel the weight of him. It’s harder to access that sensation now. After nearly ten months without touching or holding my son, sometimes I have to reach further to remember that feeling of carrying his weight, and there is a new grief in that. I am finding my arms that were once strong enough to carry around thirty pounds of boy as well as all of our gear, maybe even a cat, are weakening such that I don’t want to heft heavy objects anymore. I find myself surprised when I strain to pick up something that was once so easy, saddened that such resistance is so unfamiliar now. The sort of strength training we undergo as parents is the best sort. Our muscles adapt slowly to our growing children so that we become stronger as their weight becomes greater. It was true in the hospital too that the more burden we were offered, the more we carried and even normalized because what else is a parent to do but carry the weight of the child, and when necessary, the weight of the child’s illness, the weight of circumstance and need and fear and pain? In Jonathan Safran Foer’s book Extremely Loud and Incredibly Close, the central character, a little boy who has lost his father, frequently describes his grief as “heavy boots,” and this is one of the most apt descriptions of profound grief that I have found. There is an immense weight to grief, one that makes the bereaved feel the gravitational pull is somehow magnified with the loss of a person. Sometimes it feels like a lead apron was somehow sewn into me, that this new burden is forever part of me. But even that I am learning to carry, some days with a bit of grace and others in a lumbering, faltering, fashion that reveals just how heavy this weight really is. But this is the weight I have left; it is my duty to carry it with me, just as it was my duty as Caemon’s mother to carry him. This lead apron, my own heavy boots, they make up the 3-G force of loving my boy and losing him. This entry was posted in grief and tagged bereaved parents, Caemon, grief, JMML on December 1, 2013 by T.